Any person who makes a new copy of a recording must obtain a license for each song on that recording. This is true throughout the music industry and is a standard process known as “mechanical” licensing. The fee you pay to me covers only the recording I created for the learning track, but you must also obtain a mechanical license from the copyright owner of the original song for each copy (whether digital or CD, etc) that you want to create of the song(s) on each learning track. For example, a quartet would need just 4 copies... and more for a chorus, etc. The per copy fee is typically very small – a few cents. To purchase a mechanical license for the learning tracks, you can register online for a free account with the Harry Fox Agency (HFA). They represent most songs that you'll be searching for. Go to www.harryfox.com and click on the HFA Songfile link. Or...click on the image below to link straight to the HFA registration page. If the song is a composition written by Aaron Dale (see the list of Arrangements to find out), the mechanical fee for the learning track is included in the cost of the learning tracks. 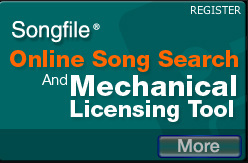 If the song is public domain, there is no mechanical license applicable.